Do you remember this saying from Jesus’ lips: “Woe to you, Korazin! Woe to you, Bethsaida! For if the miracles that were performed in you had been performed in Tyre and Sidon, they would have repented long ago, sitting in sackcloth and ashes. Luke 10:13.” Yes, He really cursed those cities, because they had Him there, they heard Him, and they saw the miracles, but they decided not to believe in Him. When I think about those cities and the Lord’s curse I cannot stop thinking about Bethlehem and the region. We all know the story about the shepherds. They received the visit from an angel and after that a great company of heavenly host, confirming the message of the angel about the baby. The message was simple: “Today in the town of David a Savior has been born to you; he is Christ the Lord. Luke 2:11.” Those shepherds, not only believed, but also went to Bethlehem to check it out. So the question is, why the people in that region did not accept the shepherds’ report and testimony and went there to check baby Jesus? How could they miss that extraordinary opportunity? Let me share some possible reasons with you. Or maybe it was because of the place. When they heard that the Son of God was in Bethlehem in a cave designated for animals, they simply shut down. 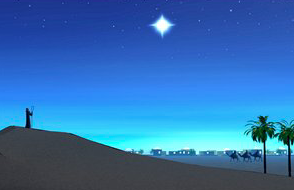 If He was supposed to be the Messiah, He should be born in Jerusalem, in the Temple, or in the Palace, but not in a small town, and have a manger for a crib. Or maybe it was because of the news, the message in itself. The angel was very clear that the baby was the Savior, the Christ (Messiah), and the Lord. They did not hear wrong. That baby was the Son of God, the long waited Messiah, and the one who was coming to save them and be their Lord. Probably it was too much for them. If he was a prophet, a teacher, a good man, or a strong leader, maybe they would believe, but Savior, Christ, and Lord, no, it could not be. Unfortunately, this Christmas many people around the world will miss the opportunity to check Jesus out. Maybe because of the messengers, or because of the place, a small town, small church, who knows. But many will decide not to believe because of who He is. When you understand that He is the Savior, the Christ, and the Lord, the only viable option that you have is to surrender to Him and praise God. This entry was posted in Uncategorized and tagged Advent, Christian, Christianity, Christmas, encouragement, Evangelism, Faith, opportunities. Bookmark the permalink.